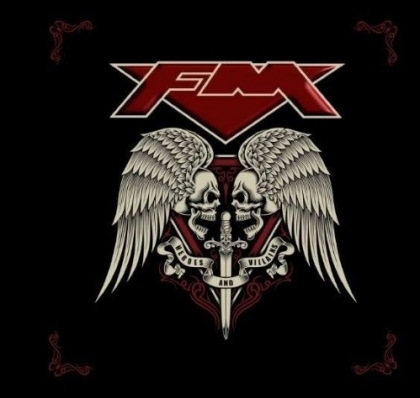 FM started out in 1984, when ex. SAMSON rhythm section Pete Jupp, drums, and Merv Goldsworthy connected with the Overland brothers, vocalist/guitarist Steve and lead guitarist Chris, plus keyboard player Didge Digital (aka Philip Manchester). The quintet signed with CBS/Portrait and their debut “Indiscreet” was released the following year. “Tough It Out” and “Taking It to the Streets” followed in 1989 and 1991 respectively. Chris Overland and Didge Digital left during that time span and were duly replaced by Andy Barnett and Jem Davies. The band lasted two more albums, 1992´s “Aphodisiac” and 1995´s “Dead Man´s Shoes” before calling it a day. 2007 saw the return of the band. Merv, Pete, Steve and Jem were back, and at Chris´s suggestion they had recruited Jim Kirkpatrick on lead guitar. This line-up remains a going concern and this is their fourth outing since the reunion. What you expect from an ageing British rock band is pretty much what you get here. From the first chord of “Digging Up the Dirt” onwards there is absolutely no doubt about their geographical position. The bass is groovy, the keyboards are softly in the background and there is blues in the background too. A slight Mr Mister goes UK feeling comes about during “You´re the Best Thing About Me” while Bryan Adams echoes in “Life Is a Highway”. “Incredible” and “Call on Me” are the less spirited moments, while most songs are true contenders for THUNDER. There´s no real hit, but there are so many worthy numbers that states that Brit Rock is alive and well and will be so for a foreseeable future. There´s definitely more mileage in FM!